The weather cooled down this week and today it just barely made it above 70 degrees. This allowed Maggie, Sally and me to go for a walk along the Arroyo Mocho Trail before working on the various projects around the Red Dog Estate. As you can see in the picture, Maggie and Sally are quite happy to be out and about. All good reasons to be happy! 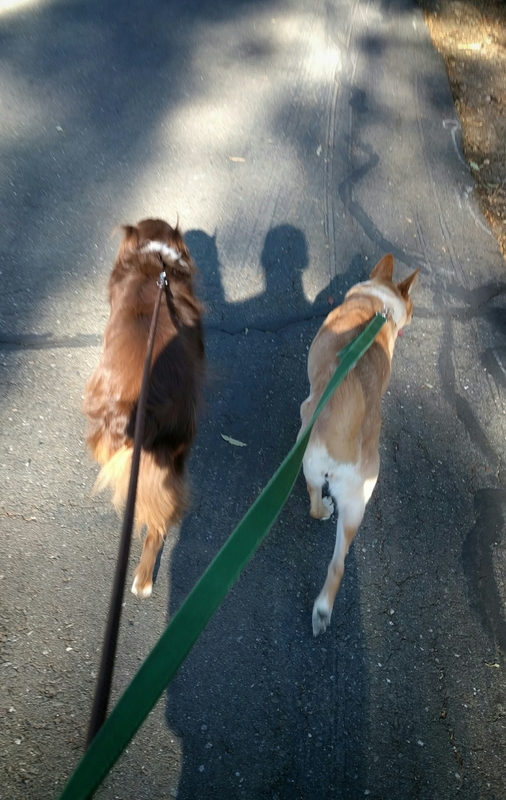 Logan and Bailey wish they could enjoy an outdoor walk with Maggie and Sally. It continues to be the summer from hades here in the desert Southwest. Enjoy the cool temps and walks. I suspect we will be back in the 90’s and 100+ soon. Then it will be back to late evening walks. Maggie does not do well over 85 degrees with her thick Aussie coat. Sally could care less…a very laid back couch dog.